Bartolo Cabahug was born around 1830, judging from the age of his wife at the time her death3. In the Protocolos, his name is recorded as Bartolome, while later he was referred to as Bartolo. Bartolo married Florencia Seno, probably in the mid-1850s. Florencia was born about 18343. Bartolome appears in the Protocolos three times and the entries provide interesting background on his life. In 1862, Bartolome granted a power-of-attorney to Tomas Senisa to plead a case against Don Alipio Mangubat, Gebernadorcillo (Mayor) of Borbon42. The case involved a dispute over a piece of agricultural land in Borbon. The beginning of this entry, shown above, indicates that Bartolome was a mestizo and a vecino de Mandaue (resident of Mandaue). The following page shows that Don Pedro Normandia acted as translator. At this time, Bartolo was clearly not fluent in Spanish. From the record, Bartolo was apparently interested in agricultural production and ran into difficulty with the local authorities. The next entry in the Protocolos, in 1873, records the sale of land in Mandaue by Agustin Sanchez, vecino de Consolacion (resident of Consolacion) to Bartolome Cabajug de la misma vecindad (of the same vicinity)43. This suggests that Bartolo may have lived in Consolacion, though the meaning of tabindex the text is not completely clear. Since the Town of Consolacion was founded in1871, from part of Mandaue, "vicinity" might refer to the nearby Town of Mandaue. In any case, Bartolome was living in the Mandaue area at the time. 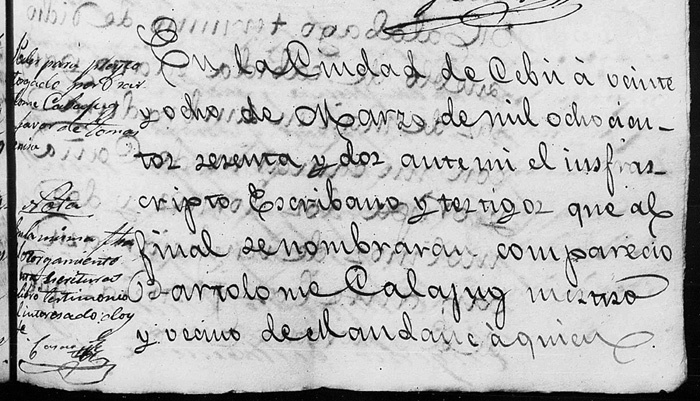 The final entry in the Protocolos, in 1878, records the sale of land in Borbon between Cipriano and Fruto Eveñes and Modesto Cabajug44. The description of the piece of land being sold, includes the owners of adjacent properties. In this case the lands of Bartolome Cabajug lay to the South and to the East of the subject property, while that of Apolonio Mangubat lay to North and that of Pedro Mangubat to the West. The close proximity of Bartolome's land to that of the Mangubat family may be related to the dispute mentioned above. The above information shows that Bartolo was a successful businessman, probably owning several pieces of land devoted to agricultural production. Typically, he would have contracted with tenant farmers to work the land and would share in the crops, which he then transferred for trade in the local and international markets. Bartolo continued to live in the Mandaue area, probably Consolacion. He died there sometime before 1900. Florencia died on June 28, 1916, in a barangay of Consolacion, Mandaue, at the age of 823. The Town of Concolacion had reverted to Mandaue in the early 1900, due to financial difficulties. Consolacion was re-established as independent town in 1920.
i. Romualda Cabahug41 Romualda was born about 185751 and she died May 26, 192751.
ii. Luis Cabahug Luis was born about 18633, and he died on October 8, 19483. Luis married Obdulia Barz. iii. Eriberta Cabahug Eriberta was born about 18683, and died on October 10, 19273. She married Roque Ceniza. iv. Pedro Cabahug Pedro was born about 18703. He married (1) Apolonia Briones and (2) Marta Labares. v. Francisco Cabahug Francisco was born about 18753, and he died on January 27, 19113. Francisco married Canuta Enriquez. vi. Fabiana Cabahug Fabiana was born on January 20, 18819, and she died on August 26 19469. Fabiana married Crispiniano Pesons. Romualda Cabahug was born about 185751, the oldest known child of Bartolo Cabahug and Florencia Seno, probably in Mandaue. However, she became a long-time resident of Borbon. Romualda died on April 26, 1927 at the age of 7051. She remained single throughout her life. i. Donato Cabahug Donato was born about 190051. On November 25, 1923, Donato married Restituta Monera51. She was born about 190551, the daughter of Rufino Monera and Ambrosia Gojo. Donato and Restituta had at least two children. ii. Andrea Cabahug Andrea was born about 190051. On July 7, 1925, Andrea married Feliciano Hortel51. He was born about 188551, the son of Bonifacio Hortel and Candida Mangubat. iii. Guadalupe Cabahug Guadalupe was born about 190151. On October 8, 1927, Guadalupe married Laureano Precillas51. He was born about 190051, the son of Maximo Precillas and Lucia Monleon. Laureano and Guadalupe had at least one child. Luis Cabahug was born about 18633 and he married Obdulia Barz, who was born about 18693. Luis Cabajug is mentioned in a 1891 entry in the "Protocolos" as a "Cabaeza de Barangay (Barangay Captain) in Mandaue50. Obdulia died on October 18, 19363, and Luis died on March 8, 19483.
i. Romualda Cabahug Romualda was born on August 10, 190120, and died on April 19, 19833. She married Paulino Soco. Paulino was born about 18943, and died on January 14, 19883. Paulino and Romualda had four children. ii. Antonina Cabahug Antonina was born on May 3, 19023.
iii. Potenciana Cabahug Potenciana was born on May 19, 19043, and died on January 23, 19853. She married Juan Jesus Dabon on September 7, 19293. Juan was born about 19063, the son of Diego Dabon and Lucia Cortes. Potenciana had seven children. iv. Lourdes Cabahug Lourdes was born about 19063. She married Magno Amora on November 24, 19453. Magno was born about 19073, the son of Felix Amora and Romana Ranses. Magno and Lourdes had two children. Eriberta Cabahug was reported to the Cabahug Clan by the descendants of Bartolo Cabahug as one of his children41. Eriberta was born about 18683, the third child of Bartolo Cabahug and Florencia Seno. Eriberta married Roque Ceniza about 1890, and they lived in Mandaue. Eriberta died on October 10, 19273, and Roque died on September 28, 19383, at the age of 82.
i. Roberta Ceniza Roberta was born about 18943. She married Julio Ouano on May 7, 19283. Julio was born about 18903, the son of Rafael Ouano and Quintina Rosal. Julio and Roberta had five children. ii. Florentino Ceniza Florentino was born on October 16, 19063. Francisco Cabahug was reported to the Cabahug Clan by the descendants of Bartolo Cabahug as one of his children41. Francisco was born about 18753, the fifth child of Bartolo Cabahug and Florencia Seno. Francisco married Canuta Enriquez in the late 1890s. Francisco died on January 27, 1911.
i. Natividad Cabahug Natividad was born about 19003, and she died on October 31, 19523. Natividad married Pedro Sanchez on January 28, 1921, the son of Paulino Sanchez and Eustagenia Logarta. Pedro and Natividad had five children. ii. Fernando Cabahug Fernando was born on May 30, 19023.
iii. Primitiva Cabahug Primitiva was born on July 5, 19043, and died on April 24, 19223.
iv. Luis Cabahug Luis was born on June 20, 19073, and died on June 1, 19873,9. He married Candida del Castillo on July 07, 19383. Candida was born on June 6, 19143, the daughter of Benjamin del Castillo and Eulalia Ceniza. She died on June 12, 19979. Luis and Candida had eight children. v. Francisca Cabahug Francisca was born about 19113, and died on March 6, 19853. On July 11, 1946, Francisca married Bernardino Mendoza3. Bernardino was born about 19083, the son of Melanio Mendoza and Eusebia Seno. Fabiana Cabahug was reported to the Cabahug Clan by the descendants of Bartolo Cabahug as one of his children41. Fabiana was born on January 20, 18819, the sixth child of Bartolo Cabahug and Florencia Seno. Fabiana married Crispiniano Pesons. Crispiniano was born on October 26, 18769. Fabiana died on August 26, 19463,9, and Crispiniano followed on January 28, 19763,9.
i. Dinoterio Pesons Dinoterio was born on May 22, 19123.
ii. Fabiano Pesons Fabiano was born on January 28, 19163. He married Norma Achas. Fabiano and Norma had two children. iii. Libertito Pesons Libertito on August 17, 19173, and died on April 23, 19829. He married Fedencia Pino. She was born on November 26, 19243,9, the daughter of Isidor Pino and Maria Patalinghug. She died on April 1, 19859.
iv. Ciriaco Pesons Ciriaco was born on August 8, 19203,9, and died on December 25, 19919. Ciriaco married Dioscora _______. She was born on May 21, 19219, and died on May 29, 19999.
v. Pantolome Pesons Pantelome was born on August 8, 19203. Juan Cabahug was probably born in Mandaue but lived in Borbon. He married Bonifacia Monteban. i. Anesia Cabahug Anesia was born about 190751. On November 6, 1927, Anesia married Elpidio Calatrava51. He was born about 190651, the son of Fortunato Calatrava and Fortunata Honorio. Elpidio and Anesia had at least one child.